My darling friend Kristen and I came together to create The Art of Thanksgiving, a photoshoot we dreamed up to cultivate community. We're both total lovers of pretty and functional things, she's a professional ceramic artist and floral designer after all. And although what we do is different, the mediums we work with are strongly connected to the earth and our communities. We both create for the table at which people gather to connect. So it was a no brainer for us to combine our passions - my meals and her wares - to create something really special. 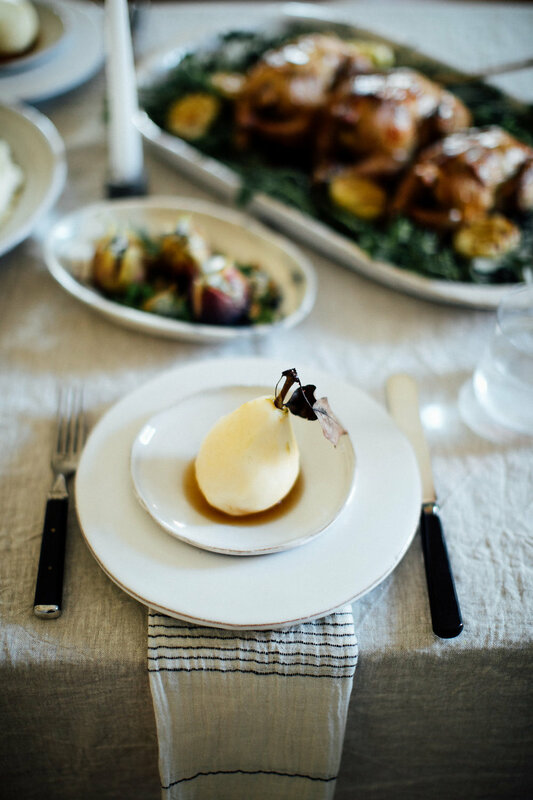 I'll be sharing the collection of recipes for you to use for your Thanksgiving dinner. Read more about the shoot and see the other recipes featured. I am obsessed with this dish. It's really a perfect way to start or end a meal with friends. There's something so lovely about poached fruit, cheese, and nuts. I suggest you skip the baked brie this Thanksgiving and make this dish instead. Don't be intimidated by this one, friends. Poaching a pear was the very first technique we learned in culinary school because it's easy to learn and important to know. That means you can do it too. If you've ever successfully made pasta, you can poach a pear. 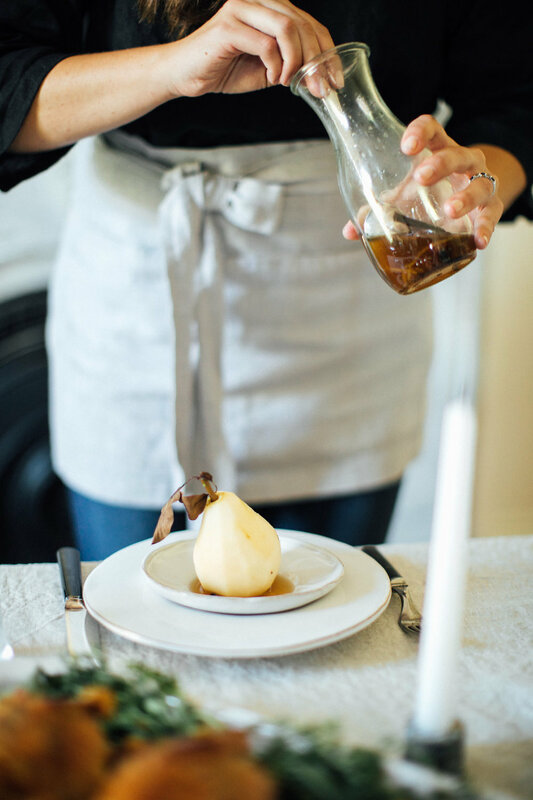 If you've ever successfully made mulled wine or cider, you can poach a pear. If you've ever successfully made a soup, you can poach a pear. Have I convinced you yet? Serve with ricotta salata and chopped walnuts for a wonderful cheese and fruit appetizer or dessert. 1. Combine wine, sugar, lemon zest, lemon juice, peppercorns, cloves, and cinnamon in a medium sauce pan. Cut vanilla bean in half lengthwise to reveal the seeds. Using the tip of a paring knife, scrape seeds out and add seeds and pod to wine mixture.2. Mix with a wooden spoon, and bring mixture to a strong simmer over medium-low heat. 3. Using a slotted spoon, one by one slide pear halves into simmering mixture. Cook for 10 minutes, and turn the pears over. Continue to cook for 10 minutes, or until a toothpick can be inserted into the pears with little resistance. 4. 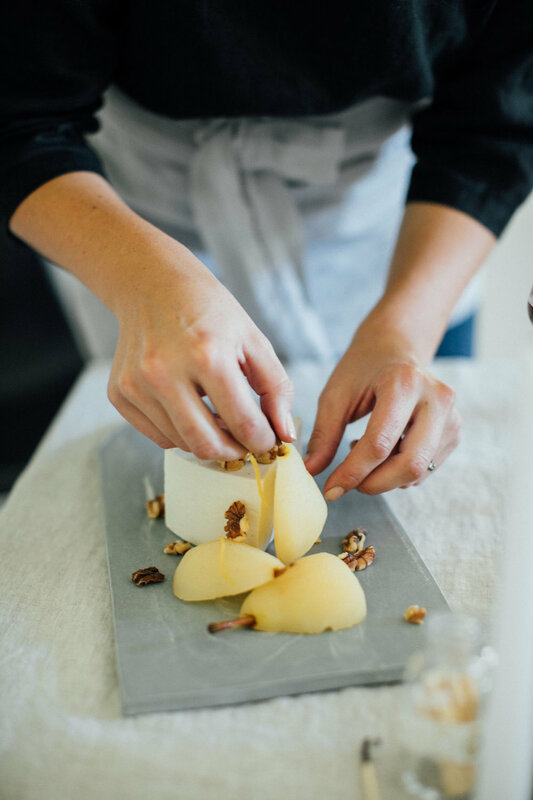 Using slotted spoon, carefully remove pears from mixture and set aside.5. Turn up the heat to medium-high, and boil wine mixture for 10 minutes, or until reduced by half. Strain mixture into a bowl, and discard spent spices. 6. 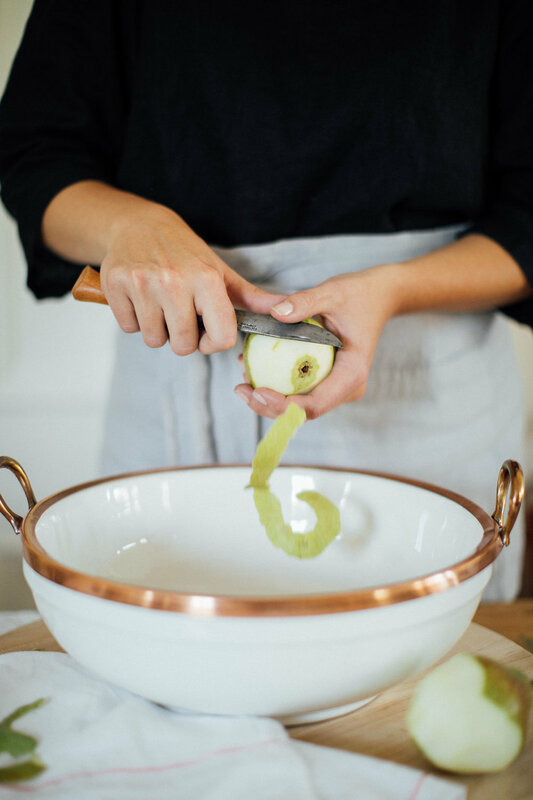 Serve pears in a shallow bowl or a cheese board, and spoon the reduced and strained wine mixture lightly over top. Add a small wedge of Ricotta Salata and chopped walnuts. Enjoy!